Bordeaux is a mythical destination for wine lovers and the romantic name alone evokes images of fairy tale châteaux and manicured vineyards. The region of Bordeaux offers a diverse range of landscapes from the medieval hamlets and bucolic scenery of the right bank; to the flat, ex-swamplands of the Médoc punctuated with stately manors and wine estates; to the beaches and sand dunes of the Arcachon Peninsula. There are literally thousands upon thousands of wineries, many of which are household names to wine collectors. And the city of Bordeaux, whose historic mansions and graceful buildings have seen a major facelift and cleanup in the last decade, is something of a mini Paris and utterly delightful. 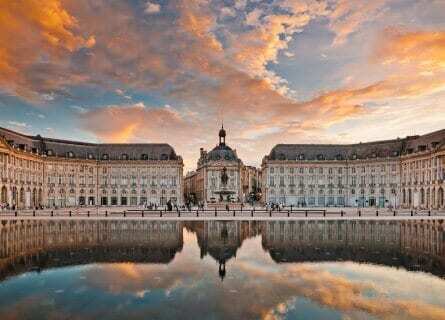 This luxurious private tour of Bordeaux town and region has been designed for wine lovers who also love fine living. Visit beautiful wine estates with charming, friendly hosts and learn all about the complex and fascinating history of Bordeaux and its wines. Intersperse the wine sipping with promenades in the vineyards, tours of Bordeaux’s golden triangle and St Emilion with local art historians, a boat ride in the striking Arcachon basin. Try the tasting menus of some of France’s most talented Michelin starred chefs and contrast these sumptuous gourmet meals with easy, convivial bistro dining. If you are looking for an unforgettable luxury vacation in Bordeaux combining fine wines, châteaux accommodation, some fabulous meals, and terrific hosts, then contact us for more information on customizing this tour. Your elegant and friendly driver and sleek Mercedes will greet you at the airport and take you into the historic center of Bordeaux where you will be staying at a fabulous luxury hotel right across from the theatre. Check in, relax and settle in. Your guide will collect you in the afternoon to take you on a fun and interesting private tour of this lovely city. Begin with a stroll through the Place de la Comédie, which sits atop the ancient Roman forum. Admire the beautiful Grand Théatre, built in the late 1700s and now a venue for opera and events. Over the next few hours, take in all the sights including the striking Place de la Bourse, the impressive Grosse Cloche, and the ethereal 11th-century Cathédrale Saint-André. Listen to anecdotes and local legends as you trace the footsteps of historic personalities such as Thomas Jefferson, Victor Hugo, Emile Zola, Eleanor d’Aquitaine and Napoleon. Finish the afternoon with a glass of vin of course, in an enchanting wine bar. Before dinner, you will have a chance to get freshened up. Dinner is a fine affair this evening in the 2 Michelin starred restaurant of Le Grand Maison, Pierre Gagnaire proudly came on board in 2016 and has been cooking up a storm since. You will be treated to the tasting menu paired with Bordeaux wines. The menu is seasonal, but you can expect such delicacies as Diced Blue Lobster with verbena, baby spinach and celery stalk, Red tuna grilled very rare, marinated in a scented bouillon with lightly salted anchovy toast or Farmed rump of veal scrubbed with curry herbs, slow-simmered sorrel, raspberries, and red beetroot. Finishing of course with a sublime “Pierre Gagnaire Grand Dessert”. This is the most superb welcome to Bordeaux. The beautiful area of Leognan is in store today, with visits to two top Graves estates. 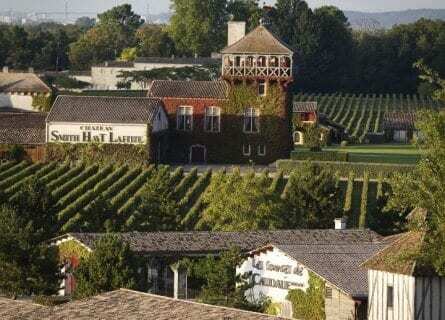 Begin with a stop at Carbonnieux, one of the oldest winemaking estates in Bordeaux. The cultivation of vines at the Carbonnieux estate dates back to the 12th century when it was founded by Benedictine monks from the Sainte Croix abbey in Bordeaux. The estate’s wines became internationally famous in the 18th century when the monks capitalized on the remarkable purity of the white wines by coining them Carbonnieux Mineral Water. The monks even exported the wines, including to Constantinople where the Grand Turk apparently adored them. The symbol of this estate still references its origins with its cross emblazoned with the letter “S”. While the red wines here are great, the white wines are truly world class and to start your day you will enjoy a vertical tasting of their best whites. Follow with lunch at the Caudalie wine spa estate at the Table du Lavoir restaurant. This warm and rustic space has a huge open fire and a very cozy feeling. The cuisine is country fare and you might try duck magret roast with figs or a chargrilled steak with béarnaise sauce and homemade frites. After lunch, you will visit the prestigious Smith Haut Lafitte winery, on the same gorgeous property. Your host is excellent and after a tour of the historic chais (cellars) finish the visit in their tasting room, overlooking the vineyards. Tonight, you are staying in a gorgeous privately owned nearby Château and you will feel like the lord of the manor, with your own private chef and all! Check in and chill out. You could go for a walk through the vines on their quaint estate, take a bath with the luxury bath salts you get in your welcome pack or watch the sunset while sipping an aperitif. Dinner will be prepared just for you in their intimate dining room. Your chef is extremely hospitable and fun, a real treat you will undoubtedly enjoy! Today you are going to visit the chic area of Cap Ferret, the “Hamptons” of Bordeaux where the well-heeled have their villas, from movie stars to football players. Your driver will pick you up in the Graves wine country and you will travel west towards the Atlantic and board a private boat near the Dunes of Pyla, the largest natural sand dunes in Europe. You have a special and unique day planned! 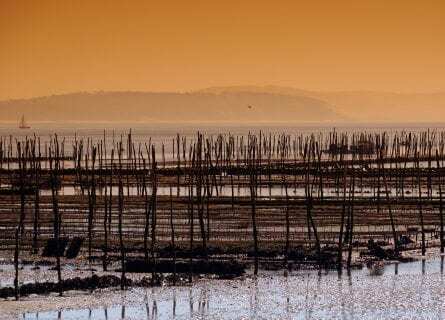 Explore the picturesque Arcachon Basin by boat and pop into the mythical oyster shacks and fisherman huts to taste the world famous local oysters, paired with champagne of course. Sail on to Cap Ferret, a woodsy beach town on the peninsula and sit down at your waterfront table at Café Pinasse. This shabby chic locale attracts all the local celebs and high society, and above all seafood lovers. You will have a seafood extravaganza for lunch- Aquitaine Caviar, langoustines, mussels in garlic and white wine sauce, and naturally all paired with local wines. After lunch, your driver will take you back to your Château where you can relax, enjoy some free time and have a light dinner tonight. Rhubarb, dairy cream refreshed with a sorbet” a truly sumptuous treat. In the evening, arrive at your luxurious abode for the next few nights, the absolutely stunning Château La Lagune. Be welcomed like royalty by your own private butler and settle into your bedroom with romantic, period furniture. Freshen up and explore the property with its extensive vineyards and parkland. The private VIP dinner tonight is in the prettiest and coziest French country kitchen you could imagine. You will have your own chef and dishes vary by season but might include dishes like lobster bisque, wine poached salmon with black truffles and then finished off with superb, just- made chocolate soufflé. The delicious wines of the estate will be on offer and you can taste their premier wines and discover for yourself why they have been so well received by wine critics and collectors around the world. After dinner, why not sip a cognac in the drawing room? Magnifique. Spend the day in the most graceful appellation of the left bank today- Margaux. You will visit some of our favorite estates here such as Kirwan and Giscours and even admire the vineyards from the air today on a private helicopter ride! Begin the day with a private tour and tasting at Kirwan where the super friendly owner herself will greet you and join you on a captivating helicopter ride and aerial tour of the vineyards. This is a highlight of your vacation in Bordeaux!! After this riveting experience, tour the Kirwan estate and conclude with a tasting of five of their best vintages from the ’80s, ’90s and into the new millennium, and a private lunch. Here you might be treated to “Escalopes de foie gras poêlées et fruits de saison” (Foie gras escalopes with seasonal fruits), Magret de canard en croûte de sel et légumes de saison (Duck breast with a salt crust and seasonal vegetables) and almost certainly finishing with Assortiment de fromages servi avec Cheese platter served with Château Kirwan 1981 and a Tarte Tatin (Apple tart). Next on to Château Giscours; the origins of the actual estate date back to the 14th century when it was a fortified dungeon. Wine has been made on the property since the 1550s and a century later it was being served on France’s sun king Louis XIV’s tables. Your dashing Dutch host has lived in Bordeaux for twenty years and is passionate about his adopted wine region. Tour the estate and learn all about the history of Giscours, taking in the beauty of the surroundings. In the afternoon at your leisure (you could do some wine shopping in Margaux first if you like), return to your private Château. Dinner tonight will be based on your preferences, the chef is at your disposal. The tour just keeps getting better! Tonight you will head into medieval Saint-Emilion, your base for the next few nights. But first, you will visit the St Estèphe, Pauillac, and St Julien appellations and dine at one of Bordeaux’s hottest restaurant. Begin the day with a private tour and tasting at the outstanding Cos d’ Estournel, one of the absolute best estates in Bordeaux. Probably the most beautiful winery too, with its dramatic Oriental inspired Pagodas. Cos d’ Estournel has just completed a massive, three year, multi-million euro renovation of their cellar. The gorgeous new Indian baroque style cellar room with its elephants and candles was designed by Jacques Garcia of Costes in Paris and the Regent in Bordeaux. And the stunning new vat room was designed by the same architect that designed the Louis Vuitton shop on Champs-Élysées. Take in the beautiful cellar and continue with a tasting of various vintages of Cos d’ Estournel and their unique and delicious white wine- a novelty for the region. Next up is a visit in neighboring Pauillac, with its powerful “monster” red wines adored by the likes of Robert Parker. 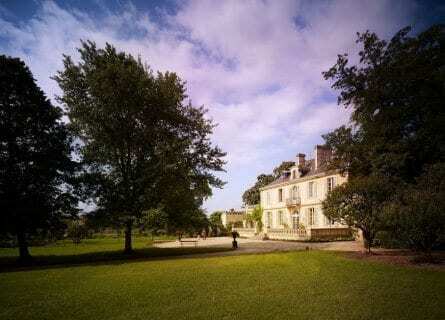 You will visit one of the loveliest and friendliest estates, the Château Pichon Comtesse de Lalande. 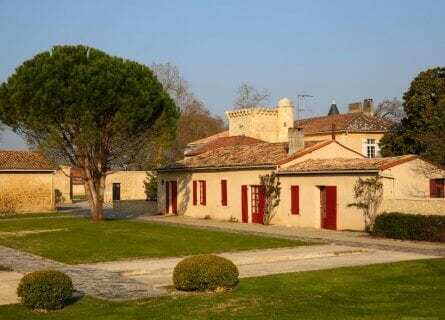 One of our favorites, this estate is located just across the street from the fairy tale Pichon Longueville estate and it borders vineyards with the 1st growth Latour. We love this winery not only for its terrific wines but for the beauty of the property and the warm welcome. You will also visit their small, quaint glass museum with views over the vineyards and the Gironde estuary. Super! Don’t worry- lunch is next! And what a lunch, a tasting menu at Cordeillan Bages, a Relais & Chateaux renowned for its cuisine. The cuisine is daring, outrageous and creative, quite out of this world. 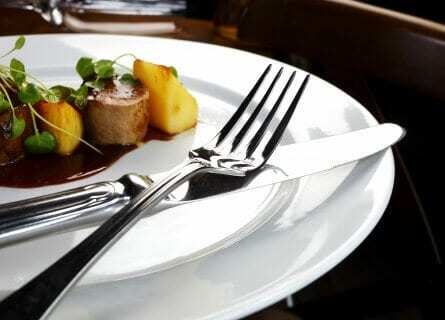 You will try a variety of tasting dishes paired with wines from around France. Let your taste buds explore new dimensions! The last activity of the day is a fun, relaxed wine blending class in St Julien (only a few minutes down the road) at the highly esteemed Château Lagrange estate. Learn how the winemakers here do the “assemblage” and what makes a Bordeaux blend. In the evening, you will arrive at your boutique hotel, set amid the vineyard. You will probably not be hungry enough for dinner, but for a nibble, you can head into St Emilion. Settle in and enjoy your picturesque surroundings. Yesterday was a full day, so you have the morning today to sleep in late, relax or go for a swim in their beautiful natural swimming pool overlooking the vines. 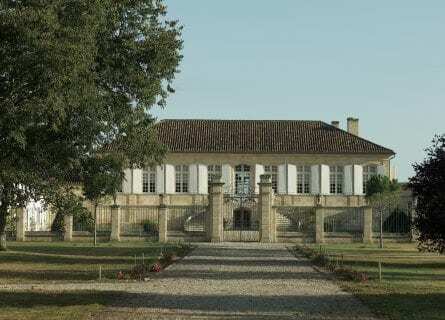 At noon your driver will collect you and you will travel to the Sauternes appellation on one of the prettiest country roads in the French wine country. Arrive at the Coutet estate in Barsac, our personal favorite in the region with its historic Château, 13th century English tower and extremely charming French-American owners. Instead of yet-another tour and tasting, today you will taste their wines as they were made to be tasted- over a meal. In the private family home, enjoy a specially prepared multi-course lunch paired with their best wines (sweeties from Barsac-Sauternes) and with the owners themselves. This is an intimate and friendly experience and if the weather is nice you can even sip the aperitif on their scenic terrace, overlooking the vines. Lunch will be in their homey dining room amazingly unfussy even with its original Chagall painting. It will include perfectly executed dishes like quail piccatta, buttered lobster, monkfish in a lemony sauce, pressed chicken in a terrine. This is a unique and special highlight of the tour at one of the top 1st growths in Sauternes. There is no rush today and at your leisure, head back into St Emilion. The rest of the afternoon is yours to explore this medieval gem. Dinner tonight is on your own, there are a number of good bistros and wine bars in the village. Alas, today is the last day of your tour. We better make it special! How about tasting some incredible wines, visiting medieval wine caves, exploring underground churches and finishing up with a spectacular tasting menu at St Emilion’s most famous gourmet haunt? You will start the day in the heart of the ancient hamlet of St Emilion, a UNESCO world heritage site. Escape the hordes of tourist above ground, for a private, underground tour! Trace the steps of the crusaders and saints. Admire the amazing monolithic cathedral from the inside and hear about local legends ranging from the catastrophic 14th-century plague to modern-day grave robbers. After a fascinating morning, you will be personally greeted at Château Beausejour by one of the château’s owners, of this family-run estate, who will take you on a special guided tour of the property, which is not usually open to the public. The tour includes a walk through the vineyard, a presentation of the winery and underground cellar and then a vertical tasting of 3 vintages of Château Beausejour Premier Grand Cru Classé, in the small lounge of the Château. A truly unique experience! Next, enjoy a fabulous wine country lunch at Le Clos Mirande, this pretty, chic-rustic restaurant overlooking the vineyards of Montagne Saint-Emilion, is run by chef proprietor Laurent Supiot. Laurent creates tantalizing Bordelais specialties presented with panache. Now we have selected Château Fonplégade for you, with its beautiful setting, impeccable wines, and excellent hosts. This is the perfect place to conclude your epic wine tasting journey in the region. After a private tour and tasting of 2 or 3 of their spectacular wines return to your hotel to relax and freshen up. Dinner tonight is at the superlative, 2 Michelin starred Hostellerie Plaisance, in St Emilion where Chef Ronan Kervarrec is at the helm. Dinner is a decadent tasting menu that will include seasonal dishes such as Line-fished lean – Grilled fillet, braised leaks, “Esprit de Pavie” red wine sauce Squab pigeon – Roasted breast, preserved legs flavored with marjoram herbs and Ewe’s milk cheese – Au gratin in a potato, thin small slice of ham and then a sweet finale such as Cherry amaretto – Almond soufflé and cherry sorbet, crisp macaroons. After a splendid dinner, take a walk around St Emilion, lit up and ever so magical at night. Your driver will take you to Bordeaux airport for your outbound flight today and this concludes your unforgettable wine tasting tour of Bordeaux! 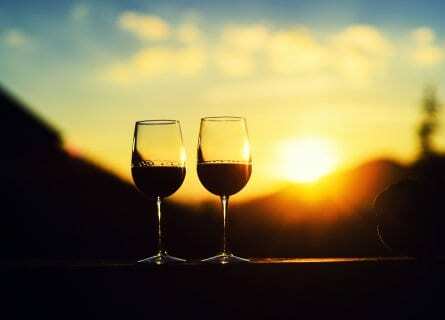 You will leave with a lifetime of sweet memories, not to mention some fantastic photos and a few Cellar Tours gifts! We hope to see you again for your next tour! Thank you, thank you, thank you. Merci, merci, merci. We have all returned to St. Louis; much wiser about Bordeaux. Each and every winery welcomed us in a most gracious way. Each was a different experience-something unique. The lunches were fantastic, gastronomical, well prepared and well served. In some instances the host and or owners dined with us. They were fun and enlightening in many ways. We all want to add a lot of praise about our driver, Mr. Gauthier. He was incredible in every way. If we can provide recommendations for your service or testimonials please just let us know. Our friends will hear a lot about our tour. Full of experiences and stories which will only get better with time…like a good Bordeaux. I want to again add that Gautier was just the right person to make it all extra special….great guy with a great sense of humor Finally, thank YOU for making it all happen. Tres Bien! What an extraordinary experience we had. Once again we have been touched by favorable divine intervention which allowed us to fully participate in what truly turned out to be a once in a lifetime experience. Thanks to you and your team. For this wine tour to Bordeaux and we have high expectations when traveling. We drank amazing Grand Cru Classe wines and ate exquisite meals, stayed in beautiful Chateaus. There is no way, we could have done this without you !! !